An essential stop if you’re passing by Trastevere. 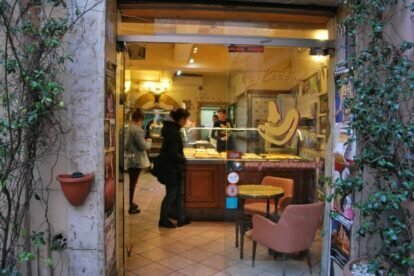 La Boccaccia is a sliced pizza shop in the quaint maze of alleys at S. Dorotea square, at the heart of the neighborhood. In an era which Trastevere is submerged by improvised pizza makers, Massimo Marganella, in my opinion, gets the first prize thanks to the quality, thanks to continuing the Italian pizza tradition in an area that is losing more and more appeal because of mass tourism. Massimo personally selects the ingredients used to create a very interesting menu. The pizza has a very light dough, is perfectly cooked and has the right crunchiness. My favorite is the one with zucchini flowers, anchovies and mozzarella. Divine! But you also have to try the white pizza (focaccia) with Nutella. The staff is very friendly and polite; the prices are very good given the quality of the ingredients. Furthermore, those few seats outside make this spot very picturesque and pleasing to look at. In the menu you will also find a vegan and vegetarian choice as pizza with layers of potatoes and rosemary. I’ll never go to another place to have a pizza snack in Trastevere and that’s why I recommend it to all of you. Offline Rome tips? Get our iPhone / Android app!